I would like to welcome my dad to the blog today to talk to us about all things planes and flying! My dad, who I think is pretty awesome, has been piloting metal beasts around the world since before I was born. He has over 11,600 hours of flying under his belt and has spent innumerous hours instructing in flight simulators. In short, he is the perfect person to address any fears and concerns that may make you a little nervous whilst in the air. So, let’s start with an easy one. Why did you want to become a pilot? Ever since I was young I have loved anything that ‘goes’!! In those early days they were just things like lawn mowers or outboard motors or billy-carts, then eventually cars and tractors and steam locomotives, but of course aeroplanes are fantastic pieces of ‘machinery’ and a really interesting challenge to make them ‘go’ properly! Of course computers have taken some of the fun out of modern aeroplanes for people like me, but they’re still interesting. Another reason I chose to be a pilot is the sheer enjoyment and exhilaration of being in the air, particularly seeing the scenery from above. I also really enjoy the travel aspect- I have lived and flown in many places which I could never have imagined myself visiting. Why do you think people are afraid of flying? I’m sure there are a variety of reasons. One would be that being up in the air in a machine would seem to be an ‘unnatural’ thing to do, but the laws of physics that allow an aircraft to fly are completely natural. Another would be that you need to trust the pilots, who you don’t even know, whereas in your own car, for example, you are still in control. 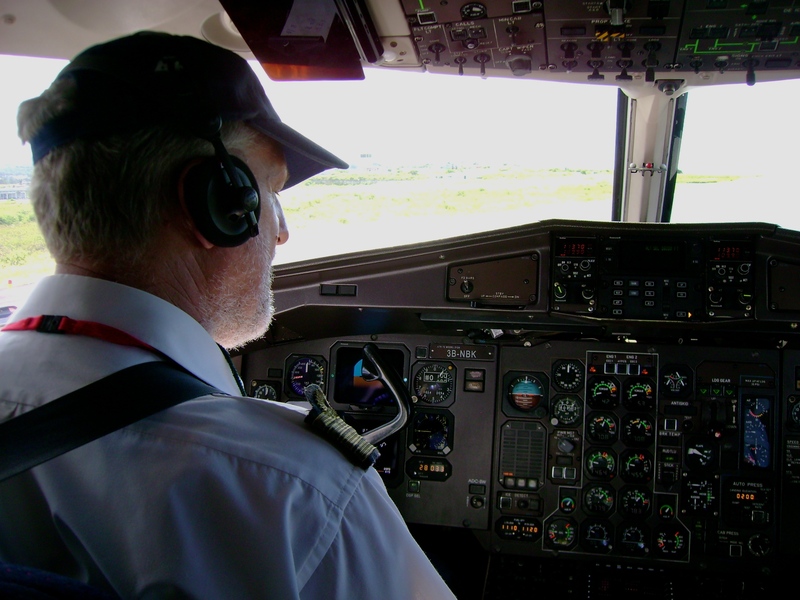 Pilots worldwide are trained to very high standards, and in most cases there are two of them checking and monitoring each other, so that if one makes a mistake the other will correct it. Pilots like being alive just like passengers!! Most have families and loved ones that they’re looking forward to going home to after the flight. Unfortunately, when occasionally an aircraft crashes, it is often dramatically and widely reported in the News, whereas hundreds of people, if not thousands, are killed daily in road accidents which often don’t even get a mention. And are there legitimate reasons to be afraid of flying? That’s more difficult to answer than it first seems. The short answer is ‘No’, none at all. The extended answer though, is that most of us have fears or anxiety about something or other, which are quite real and annoying to us. I know a superb pilot who has arachnophobia, for example. While we would all love to get rid of our fears- and that IS possible- it is ok to feel a tiny bit anxious about some things. Getting on an aeroplane as either passenger or pilot now for me is like getting on a train, or in my car- completely comfortable- but it was not always so. The point is that you shouldn’t be hard on yourself if you do feel a bit funny about flying. Okay, lets get into what you really want to know! I am sure we all get a little uncomfortable when the plane starts jumping around. What causes turbulence and is it dangerous? There are several causes of turbulence. When you are flying you are flying in air which is moving. ‘Wind’ is simply air that is moving relative to the ground. Any rapid change in that wind -gusts for example- can cause turbulence. Air also moves vertically, normal warm-day convection, or more dramatically in thunderstorms, for example. Air can also become disturbed as it passes over things on the ground such as mountains. Any time air is disturbed from a nice, steady, horizontal flow it becomes ‘churned-up’ and if you fly through this you will feel ‘turbulence’. Aircraft designers know a LOT about turbulence and how it affects aircraft, and they design all the parts of the aircraft to withstand anything it is likely to encounter during it’s long life, with considerable margins to spare. Aircraft are VERY strong!! Wings are designed to be flexible, that’s a good thing!! It makes your ride smoother and minimises the stresses on the wing itself. So if you look out the window and you see the wing and engines wobbling around like a half-set jelly that’s exactly what they are designed to do!! We have radar to help avoid the turbulence associated with thunderstorms and we try very hard generally to give you (and us!) as smooth a ride as possible. No-one really likes strong turbulence, so we can do things like climbing or descending to another altitude, or slowing down a bit just as you would driving a car on a rough road. Sometimes turbulence is unavoidable, but it usually doesn’t last too long. Just try and relax and ‘ride it out’!! And the question we are all waiting for, are there really such things as air pockets, and can they make a plane fall out of the sky? No, there are no such things as air pockets. Any time you suddenly fly into turbulence it can feel like the aeroplane is falling out from underneath you, and you might momentarily hang in your seat belt, but the aeroplane will quickly recover from this situation and all will be normal again. Flying in an area of thunderstorms, or flying through the wake of a preceding aircraft can cause this sort of feeling. We do our best to avoid it, but it’s not dangerous. Good advice though to keep your seatbelt on when seated! Now this one always scares me. After takeoff what is the funny ‘falling’ feeling? In normal (ground) life we experience gravity, which is called 1G (one gravity). On a flight most of the time in steady flight you will feel exactly the same, however there are times on a normal flight you you will feel more or less than 1 G, and this ‘falling’ feeling is slightly less than 1G. i.e.. you feel lighter. It is caused by things such as the need to level-off quickly at a lowish altitude for traffic separation purposes, or simply the ‘flaps’ being retracted after takeoff, to configure the aircraft for normal climb and cruise. Conversely you will feel slightly heavier (more than 1G) in a normal turn. It is all completely normal. What happens when a plane gets hit by lightning? I’ve never had it, but it’s not uncommon. The worst it can do is leave a black mark on the aircraft where it has struck. Modern aircraft have devices called ‘static discharge wicks’ to help dissipate any static electrical buildup in the aircraft, which may occur when flying in an area of active lightning. Lightning isn’t a problem, but we do try to avoid it. And lastly (but maybe most importantly), Is Snakes on A Plane a legitimate scenario? Hopefully some of your questions have been answered and you feel a little better about an upcoming flight or holiday. Tomorrow, our pilot will be answering questions about plane crashes, terrorists and engine failure. * I (Jo) answered this one. May or may not be accurate. Previous Post I Want to Travel but I Am Scared to Fly! Thanks Shayne 🙂 Love seeing what you’ve been up to lately- killin’ it!